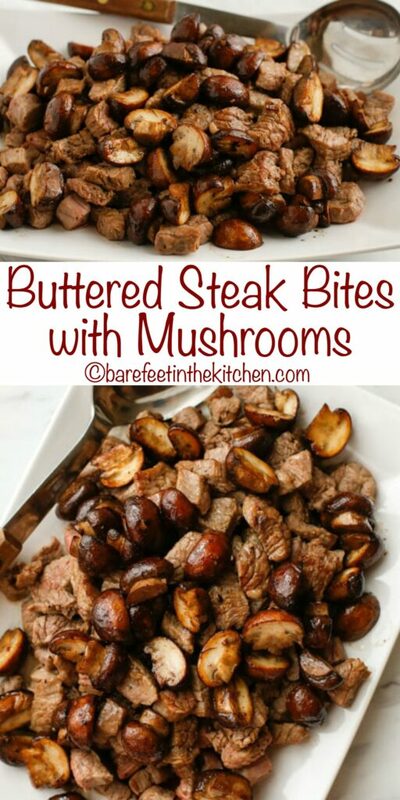 From the very first bite, these Buttered Steak Bites with Mushrooms became an instant favorite for my whole family. This is the most tender steak you can imagine and my whole family goes nuts for it. I have two boys who aren’t the biggest fans of steak. (Yes, I know, it’s hard to imagine!) However, they dive right into these steak bites and always ask for seconds. Served with Salt Potatoes and Honey Sriracha Roasted Broccoli, I love every bite of this meal. Bite-size pieces of tender steak are seared in a hot skillet just for a couple minutes until each bite is crisply browned outside and juicy inside. If you’ve been reading this blog for a while, you may have noticed that I absolutely love cooking meats in small pieces. There’s something amazing about the way each bite winds up with so much flavor despite the most minuscule of cooking times. 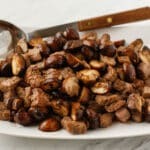 Here are a few more bite-size main dishes you might like: Chipotle Ranch Chicken Bites with Broccoli, Garlic and Ginger Glazed Sticky Pork, Asian Steak Bites, Baked Catfish Bites, and Indian Chicken Bits are all delicious easy dinner recipes. The goal when cooking steak bites is to create a crisply browned outside and a lovely pink and juicy center for each piece of meat. As the meat is cooking, if a piece is slightly larger and has a side that looks like it hasn’t browned, flip to that side again for 20-30 seconds. Take caution not to overcook the steak. Add the remaining 2 tablespoons of butter to the hot skillet and toss the mushrooms in the butter. 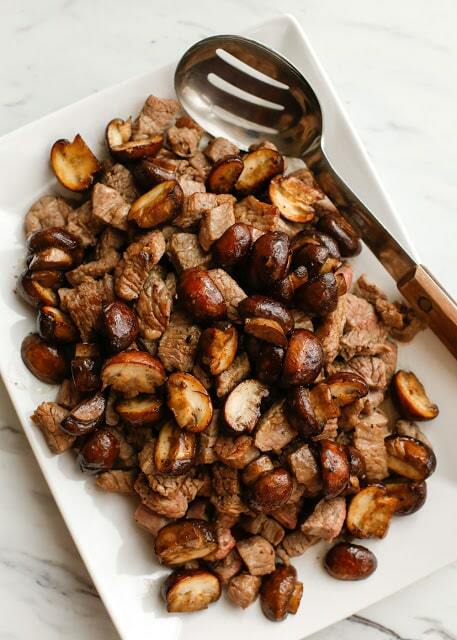 Sprinkle with the remaining salt and let the mushrooms cook without stirring for 2-3 minutes, until browned. Stir and let cook a few more minutes until soft. 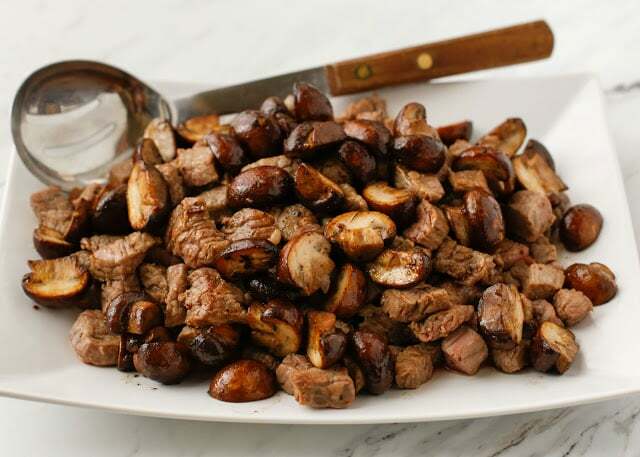 Add the mushrooms and the buttery pan drippings to the plate with the steak bites. Serve hot. The goal when cooking the meat is to create a crisply browned outside and a lovely pink and juicy center for each piece. As the meat is cooking, if a piece is slightly larger and has a side that looks like it hasn't browned, flip to that side again for 20-30 seconds. Take caution not to overcook the steak. Made this and spaghetti squash for dinner it was delicious definitely will make again. Has someone managed to calculate the nutritional value for this dish? I've made it & I LOVE it, but I'm trying to figure out how to include it in my Carb Tracker app. Hi Kristin, I added the nutritional calorie count for you. There is only 1 carb per serving. 1/4-1/5 of the dish, depending on how many people you have at the table. This sounds so good. Can't wait to try. Flank steak is the closest alternative to skirt steak. Any tender steak that can be sliced thinly or cut into small bites will work nicely. Very tastey! Added fresh, diced garlic to the mushrooms, and topped steak bites with crumbled bleu cheese. Leftovers were gone before I even got up the next morning! That sounds fantastic! The leftovers disappear lightning fast over here too.